On age reversal. Can we become immortal? The main causes of death are diseases, accidents, suicide or just old age. An increasing number of scientists are hell-bent on getting rid of the last cause or to die trying. Not only do they have the ambition to stop ageing, they even intend to reverse it. At the forefront of this groundbreaking research is a man with a name worth remembering: Aubrey De Grey. De Grey is a professor at Cambridge University and he is by far the most vocal scientist in this field. He is convinced we have a reasonable chance to ensure that our bodies stay around twentyfive years old until eternity. Theoretically, this means what you think it means: immortality! How we age – do we have a built-in genetic clock? The first one points at our genetic programming as it presumably contains the age we will reach before dying. Age is basically pre-programmed. In the early sixties, Leonard Hayflick , a researcher at the Wistar Institute in Philadelphia, discovered that after about seventy divisions, the cell division process slows down and eventually stops. He also discovered that the age of the cell impacts the number of future divisions. Basically, older people’s cells will not be able to divide as much as those of young people. Therefore, Hayflick’s research suggests that there is a built-in clock in each cell that determines how many times that cell can divide and consequently how long the owner can live. A disease called Werner’s syndrome, suggests that gene mutation does have a direct link with ageing as it causes rapid ageing. 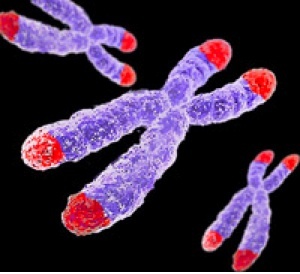 How we age – telomere shortening? The second theory about why we age is also related to genes, more specifically to cell division. In short, each cell has a strand of DNA. When a cell divides, it copies its DNA and then splits into two daughter cells. However, the copying process causes small ‘copy errors’. These errors are caused because the telomeres, the outer parts of the DNA strands, are not fully copied. They break off in the division process. Our bodies can only handle so much damage and we die once a certain “damage treshold” is attained. Spanish scientists at the National Centre of Biotechnology approached telomere decay and ageing with a specific experiment: they genetically altered mice – who do normally have telomerase switched on – to have this switched off, just as with humans. The results were thought-provoking: these ‘humanised’ mice showed the same traits of human ageing: the hair of the mice turned grey, the mice became frail and were not able to heal as quickly as they used to do. Therefore, the key to stopping ageing seems to be in preventing our DNA from breaking off as it splits into new cells. Is telomerase the golden enzyme to stop ageing? Our bodies are ingenious machines. Does it surprise you that our body has a way to counter the decay of our DNA strands caused by sub-optimal copying? The secret resides in our reproductive cells which show little or no decay at all, independent of our age. The key to this secret is called telomerase, an enzyme produced by our reproductive cells. How does it work? Telomerase stretches the imperfect DNA strands back to a state of perfection, so there is no compound decay. The good part is that this enzyme is part of our DNA. This means that all of our cells (not only our reproductive cells) are able to be repaired to this state of perfection. With all but our reproductive cells, this mechanism is suppressed from within our DNA strand by a repressor protein. Hence, the key to unlocking age reversal seems to be to ensure telomerase is active in all our cells. This is something scientists have been working on for many years. Telomeres and its protective function for DNA had already been discovered in the late thirties by a geneticist called Hermann Müller. It took about sixty years though before science truly leapt forward to research the possibilities of telomerase with humans. In 1998, a line of cells was created which was able to divide indefinitely without any decay. This means what you think it does in that human cells could be made immortal. In the year 2000, Geron Corporation, the same company which created the telomerase positive cells, did what cosmetic companies have been promising for decades: making skin younger. Finally, in 2008, scientists have successfully cloned mice with active telomerase genes. These mice actually lived about half a life longer than their regular counterparts, suggesting telomerase is the way forward to significant life extension! What if immortality were to happen in our lifetimes? We know: it is hard to grasp the idea, but what if we could ‘technically’ become immortal? Would you want it and if so, how long would you like to live? Above all else, would you change your life? It seems that there are several objections to significant life extension, ranging from “ageing is a natural process, tampering with age is unnatural”, to “our social security systems will fail if we live significantly longer”. Most of the arguments fall in to the categories of social conventions which can be altered if that’s what we want. We need a nuanced debate to determine to what extent dramatic life extension is welcomed because a wide range of philosophical and societal questions are raised. There are no right or wrong answers, which leaves it up to all of us to determine the preferable answer. Socially inspired entrepreneur, organizer of TEDx in Leuven, friend of M.I.T. Happonomy alchemist.